As physicians, occasionally in the course of caring for our patients we encounter events that truly stun us. Unforgettable occurrences that defy all of our predictions and expectations. The “Miracles Project” is a collection of these stories, medical miracles, written by leading doctors who witnessed them, physicians at the top of their fields. The project, which began in 2014, has resulted in a remarkable new book, “Miracles We Have Seen – America’s Leading Physicians Share Stories They Can’t Forget,” published in September, 2016 by HCI Books, publishers of the original “Chicken Soup for the Soul” series. Contributors to this book include pediatricians, internists, surgeons, family medicine specialists, emergency medicine physicians, obstetricians, psychiatrists, and sub-specialists in a wide variety of fields. Leaders in bedside care and preeminent educators, including deans and department heads on the faculties of the top university medical schools in the country. The common thread among us is that we have borne witness to unexplainable, unforgettable, and profoundly unexpected events— medical miracles—in our patients. 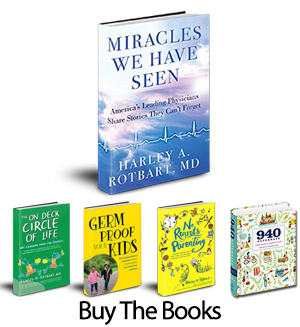 Dr. Rotbart is donating 100% of net author proceeds from sales of the book to the 65 charities chosen by the physician-essayists participating in this project. Dr. Rotbart is a nationally-renowned parenting expert, pediatrician, speaker, and educator. He serves on the Advisory Boards of Parents Magazine and Parents.com, and previously was a member of the Advisory Board of Children’s Health Magazine. His recent parenting books include, No Regrets Parenting, Germ Proof Your Kids, The On Deck Circle of Life and his beautiful combination keepsake journal/family activities guide, 940 Saturdays. He regularly speaks to large national audiences of parents, school, and youth sports organizations, as well as to community groups around the country. Dr. Rotbart also speaks widely to national professional organizations of physicians, nurses, and allied health professionals. Dr. Rotbart’s national media appearances include: The Dr. Oz Show, CBS’ The Early Show, USA Today, Parents Magazine, Time Magazine, US News and World Report, Redbook Magazine, SELF Magazine, Kiwi Magazine, Fit Parenting, Chicago Tribune, Los Angeles Times, Health Magazine, Ladies Home Journal, First for Women, VIV Magazine, Prevention Magazine, Cafe Mom/The Stir, ABCNews.com, USAToday.com, ChicagoTribune.com, MSNBC.com, Livestrong.com. 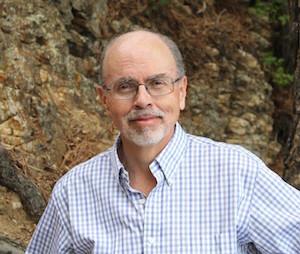 He is a regular monthly contributor to Parents Magazine’s Parents Perspective, and a contributor to several New York Times blogs and to Jill Smokler’s ScaryMommy.com. His No Regrets Parenting Show was one of the original programs on MomTV. In February, 2009, Dr. Rotbart teamed with former American Idol Brooke White for a nationwide satellite media tour promoting influenza prevention. In February, 2010, he collaborated with former American Idol Danny Gokey for another nationwide flu-awareness satellite media tour. Filmmaker Chris Condayan has prepared a video documentary for parents featuring Dr. Rotbart in collaboration with the National Academy of Sciences, which can be viewed here, or by clicking the YouTube link on this page. Dr. Rotbart has been a Pediatrics specialist for the past 34 years. He received his M.D. degree from Cornell University. His internship and residency in Pediatrics were at the University of Pennsylvania/Children’s Hospital of Philadelphia followed by fellowship in Pediatric Infectious Diseases at the University of Colorado/Children’s Hospital Colorado. Following fellowship, Dr. Rotbart joined the full time faculty of the University of Colorado Department of Pediatrics and Children’s Hospital Colorado, where he currently is Professor and Vice Chairman Emeritus of the Department of Pediatrics. Dr. Rotbart has been named to Best Doctors in America every year since 1996, as well as receiving numerous other national awards for research, teaching, and clinical work. He is the author of more than 175 medical and scientific publications in the fields of pediatrics, infectious diseases, and molecular virology. He developed and patented the gold standard test for diagnosing viral meningitis, a test still used around the world today. His book, Human Enterovirus Infections (ASM Press), is the most comprehensive text in that field.